Baby girls Millie Grace cotton christening gown & bonnet named 'Irene', in ivory or white, perfect for her special christening day. Irene Gown: This beautiful traditional fully lined long gown in linen look cotton is trimmed with satin ribbon and lace to the bodice. Featuring short sleeves and a discreet zip fastening on the back. The long skirt of the gown is tiered with satin ribbon and lace, with a delicate lace to the hemline. Bonnet: Matching linen look cotton bonnet trimmed with satin ribbon and lace, with a ribbon fastening. Available in sizes 0-3, 3-6 & 6-12 months. Please click on the Size Guide tab above to view all measurements (custom measurements also available). 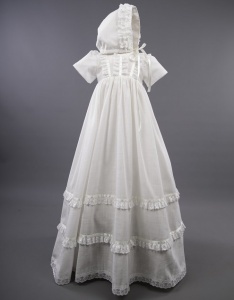 This Christening Gown & Bonnet is hand made to order for you here in England UK by designer 'Millie Grace' so once you have placed your order, please allow 2 - 4 weeks for the item to be made before dispatch (more information will be provided after you have placed your order). For urgent order's, please contact us prior to ordering to enquire. Please find the measurements for this long gown below.